The BlackHat USA security conference kicks off later today in Las Vegas, and will be attracting some of the world's top hackers and online security experts. 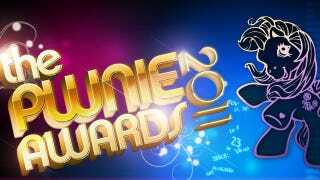 As part of the festivities, every year an awards night is held called the "Pwnies". They exist to celebrate and publicly ridicule "the achievements and failures of security researchers and the security community", and while companies like Microsoft and Google are predictably up for awards, even more predictably, Sony is in a league of its own. Following a succession of disasters that led to the loss of user details for tens of millions of its customers, not to mention the downtime suffered by the PlayStation Network, Sony is among the five nominees for "Most Epic FAIL", alongside Sony, Sony, Sony and Sony. After Fail0verflow and GeoHot published how to jailbreak the PS3, Sony got a bit miffed. Apparently unfamiliar with how the Internet works and how difficult it is to remove the piss from a swimming pool, Sony proceeded to try erase the information from the Internet and sue GeoHot et al. into oblivion. Needless to say, this was about as successful as the MiniDisc. Speaking of piss in a swimming pool, that just happened to be how well Sony protected their Sony Online Entertainment (SOE) users' account info and roughly 25 to 77 million account details were stolen by unknown hackers. That metaphor makes just about no sense at all, but you get the point: FAIL. Sony is definitely good at one thing: keeping the hits coming and their fans entertained. Oh wait, did we say Sony? We meant LulzSec. I guess that counts as another FAIL for Sony. After learning the hard way that their PlayStation Network was about as porous as air, Sony had to shut it down for over two months to rebuild it from scratch. In doing so, they made everyone from your 8-year old cousin to your barber learn about the importance of security. Hooray for us, sorry Sony shareholders. Noticing a pattern here? But wait, it gets better. Sony might have been able to better repel the multitude of attacks if they hadn't just recently laid off a significant number of their network security team. Great timing, guys. Best of luck, Sony! Remember, it's not about winning: it's just an honour to be nominated. Also up for an award is hacker George "Geohot" Hotz. Not for his hacking, mind you, or his legal battles. He's up for an award for his rapping.